Organized by the The Nielsen Environmental Field School, 2011 North American Environmental Field Conference & Exposition featured over 100 presentations by the world's leading experts on environmental site characterization, sampling, monitoring & remediation, and 59 indoor & outdoor exhibits of state-of-the-art equipment. This was the North American Environmental Field Conference & Exposition's website for a number of years. Content is from the site's 2010-2012 archived pages as well as from other outsides sources. he Nielsen Environmental Field School is very pleased to announce that the complete schedule of presentations for the 2011 North American Environmental Field Conference & Exposition is now posted on the event web site at www.envirofieldconference.com. This annual Conference, which will be held in San Diego, CA for the first time, is presented by The Nielsen Environmental Field School and sponsored by the American Institute of Hydrology, the American Institute of Professional Geologists, ASTM International, the Groundwater Resources Association of California, H & P Mobile Geochemistry, Schlumberger Water Services, Princeton Groundwater, and CRC Press/Taylor & Francis Publishers. Past events have attracted more than 1700 environmental professionals from around the world. Representatives from 19 different countries attended the 2010 Conference in Tampa, Florida. An educational Exposition featuring 59 indoor and outdoor exhibits of state-of-the-science environmental equipment and services. Detailed information on the Conference schedule, event registration and hotel accommodations can be found at the event web site or by e-mailing The Nielsen Environmental Field School at info@envirofieldschool.com. Join us in the California sunshine in January 2011 for 4 days of interactive indoor and outdoor workshops, conference presentations, field equipment demonstrations, an indoor exhibit hall, an outdoor exhibit area, and several scheduled social events. A wide variety of stakeholders in environmental site characterization, monitoring, sampling and remediation will be represented at this event, including environmental consultants and contractors; Federal, State, tribal, regional, county and local government officials (regulatory and non-regulatory); DOD and DOE environmental staff and contractors; private industry environmental staff (petroleum, chemical, utility, manufacturing, mining, waste disposal, and others); academia and other environmental professionals. This one-of-a-kind event provides a unique opportunity for environmental professionals from all disciplines - including geologists, hydrologists, hydrogeologists, engineers, soil scientists, chemists, biologists, environmental scientists, technicians and others - to interact and learn from some of the top experts, researchers and practitioners in the field of environmental site characterization, monitoring, sampling and remediation. The orientation of this event toward practical, hands-on field applications makes this an unmatched educational event that will be remembered by participants for years! This event will be held at the San Diego Hilton Resort and Spa on Mission Bay, a top-quality 4-diamond meeting facility with sleeping rooms available at a very reasonable conference rate of only $139/night (plus taxes). The hotel will host the entire event, including the conference, indoor workshops, exposition, outdoor workshops and equipment demonstrations. An active social calendar designed to encourage you to network with fellow environmental professionals, create new contacts and make new friends. 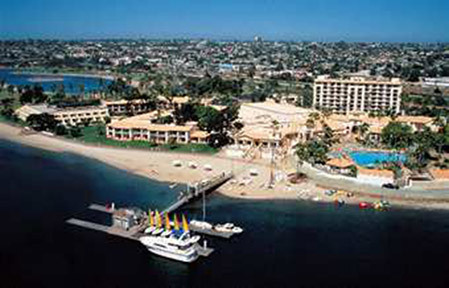 Surrounded by more than 4600 acres of pristine beaches and secluded islands, the Hilton San Diego Resort and Spa is situated on 18 acres within Mission Bay Park, an aquatic preserve and natural paradise north of downtown San Diego. The hotel is central to all of San Diego's attractions, including Sea World, the world-famous San Diego Zoo, Old Town, downtown's Gaslamp District, Balboa Park, Mission Beach, Marina Village, Seaport Village and much more. Within a 25-mile drive are attractions and features as diverse as the San Diego Wild Animal Park, Legoland, Viejas Casino, the Torrey Pines Reserve, Fashion Valley Mall, Cabrillo National Monument, Del Mar Racetrack, Solana Beach, and of course, the seals of LaJolla and Scripts Aquarium. Venture further out to find Mount Palomar Observatory, San Clemente, Anza-Borrego State Park, Joshua Tree National Park, Salton Sea and Imperial Valley, Catalina Island and many of southern California's best beaches. The Hilton is a 4-Diamond beach resort comprising a paradise of palms, sandy bayfronts, a fabulous pool and rooms with private patios and terraces and spectacular bay-front, garden and courtyard views. On-site recreation includes basketball, bicycle and boat/jetski rental, kayaking, sailing, jogging, tennis, snorkeling, waterskiing, windsurfing, beach volleyball, table tennis, and a fully outfitted fitness center featuring men's and women's locker rooms with steam and sauna facilities. Also on hotel property is the popular 7500 square foot Spa Brezza, featuring nine specialty treatment rooms, including classic facial and full body massage services as well as globally inspired therapies such as Indonesian and Thai rituals. And, don't miss dining in the hotel's 4-star restaurant, Acqua, featuring Executive Chef Herman Schafer (recently awarded Top Chef in Southern California) and his exquisite Mediterranean-inspired California Coastal cuisine and an award-winning wine list. The Hilton is located 6 miles from the San Diego International Airport. The hotel does not run an airport shuttle service, however, a number of commercial airport shuttles and taxi services do operate from the airport. Take I-5 north to Seaworld Drive, turn left at the top of the exit, turn right onto East Mission Bay Drive. The resort is 3/4 mile on the left. We look forward to meeting you in San Diego in January 2011! The San Diego area has much to offer visitors who are coming into town for several days or longer! Serviced by the large and modern San Diego International Airport/Lindbergh Field, San Diego is an easy and economical travel destination, and is an ideal location to bring your family along while you participate in the field conference and exposition. Spend the weekend before or after the conference enjoying all that the San Diego area has to offer. San Diego has virtually everything you could ever hope for (and more) in terms of attractions, theme parks, museums, shopping, beach going and sightseeing. The city is well known for its famous San Diego Zoo in Balboa Park -- one of the largest zoos in the world with more than 4,000 animals of more than 800 species, all enclosed within vast botanical plant and orchid gardens. It's on top of the list of tourist destinations in San Diego, and a great place for adults and kids of all ages. Balboa Park has more than 15 museums, including the Air & Space Museum, the Museum of National History, the Ruben H Fleet Science Center, the Minge International Museum, the Model Railroad Museum, the Museum of Art, the Automotive Museum and the WorldBeat Cultural Center. Downtown features the Gaslamp Quarter, which has something for everyone whether you're interested in fine dining, theater, shopping or sports. Night or day, the Gaslamp is a vibrant place full of things to see. Enjoy the many shops, boutiques, historic buildings, art galleries, restaurants (more than 50 of them) and more. At night, have a quiet cocktail at one of the many luxurious lounges, or get rowdy at a night club. Whether you're looking for jazz, rock & roll, hip hop or country, the Gaslamp has it all. Amusement parks more your style? Visit Belmont Park, a historic theme park located in the Mission Beach area, and experience its many fun rides and attractions, including the Giant Dipper (a wooden roller coaster that opened in 1925), a Tilt-A-Wheel, a 3-story drop tower, the Liberty Carousel, the Wave House Athletic Club & Bar, and much more. Or try Knotts Berry Farm, America's first theme park, located in Buena Park. It contains 9 roller coasters, 4 waterslides and more on 160 acres of land. And don't miss Legoland, an amusement park located in Carlsbad with more than 50 Lego block themed family rides and attractions. The San Diego Zoo isn't the only critter-oriented feature in town. Visit Sea World and celebrate the wonders of the sea. Experience Shamu's show and see hundreds of sea creatures and animals. Get up close and personal with dolphins, sharks, Beluga whales, penguins and polar bears. If you're more of a land-lubber, try the Wild Animal Park, featuring a large array of wild and endangered animals in their natural habitats, including species from every continent. Ride a safari or tour-guided caravan and experience close-up encounters with many species. But don't forget the area's beaches. Whether you like surfing, sailing, biking, kayaking, jetskiing, running, swimming, diving or just a relaxing waterfront walk, you'll never run out of things to do at San Diego's famous beaches. The most popular beaches include Coronado (just across the Bay Bridge from downtown); Imperial Beach (just south of Coronado); Ocean Beach (just a few miles northwest of downtown); Mission Beach and the adjacent Mission Bay Park, the largest man-made aquatic park in the US; Pacific Beach, with Crystal Pier and many shops and bars; LaJolla, known for surfing and seal-watching; Torrey Pines State Beach (well known for its "clothing optional" area and glider port on the cliff overlooking the beach); Del Mar and Solana Beach, home to an upscale surfer-hip community offering many activities for residents and visitors alike. Other activities are endless in and around San Diego. Hop on a tour bus or the San Diego Trolley and visit Old Town for great Mexican food (or head down to Tijuana for a real Mexican experience); visit Seaport Village, Marina Village or the Mission Valley Mall to shop yourself silly; go scuba diving or snorkeling at La Jolla Cove, rent a sail boat and go whale-watching (December to April), go skydiving, take an eco-tour, or just get away from it all at one of the areas countless parks and wilderness areas east of the city. The golf enthusiast will enjoy golfing in beautiful weather year-round at one of the more than 4 dozen golf courses in San Diego County. The beer enthusiast can hop on a tour bus and enjoy a day sampling a variety of award-winning beers at some of the many craft breweries in the city. The gambler will have a hard time deciding between which of the largest concentration of Native American casinos in the country to go to. Pechanga Resort & Casino, Viejas Casino, Sycuan Resort & Casino, Barona Valley Ranch Resort & Casino, Harrah's Rincon Casino & Resort, Golden Acorn Casino, Casino Pauma, Pala Casino & Resort, Valley View Casino and La Posta Casino are all within a 35-mile drive. San Diego's thriving gaming community is rich in culture and recreational fun. The 2011 North American Environmental Field Conference and Exposition will be held at the Hilton San Diego Resort and Spa on Mission Bay in San Diego, California. The hotel will host the conference, indoor workshops, exposition, outdoor workshops and field equipment demonstrations. The Nielsen Environmental Field School has carefully selected this venue because of its top-quality meeting facilities along with high-quality, reasonably priced sleeping accommodations. There is NO Other Field-Oriented Conference and Exposition Like This! 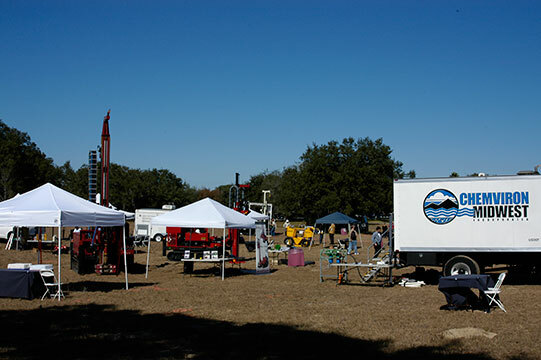 If you manufacture or supply environmental equipment, or provide environmental consulting, laboratory or drilling/direct push services, this one-of-a-kind event will be your best opportunity in 2011 to reach hundreds of environmental professionals specifically involved in environmental site characterization, sampling, monitoring and remediation. No other field-oriented event like this one is currently scheduled for the next few years on the west coast. The focus of this event on field applications of the latest environmental equipment ensures attendee interest in vendor activities, including the exposition, workshops and equipment demos. Event promotional materials have been specifically designed to attract key decision makers and equipment users and purchasers from across North America and abroad. Coffee breaks, a welcome reception, a socializer and a luncheon, all scheduled for the exhibit hall, will ensure booth traffic. This event is being held in response to overwhelming demand by a wide range of stakeholders in environmental site characterization, sampling, monitoring, and remediation including equipment manufacturers and suppliers and service providers just like you. The promotional material for this event will target the market you really want to talk to. More than 120,000 environmental professionals, representing all sectors of the environmental market, will receive promotional materials on this Event. The target audience includes those who do environmental field work, those who supervise field staff or oversee field work, those who use and purchase environmental field equipment and services, and those who use and manipulate field data, and make decisions based on the results of field work. The target attendance for this meeting is between 600 and 700 enthusiastic environmental professionals. 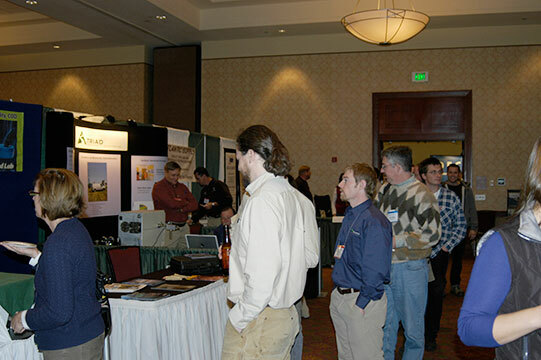 As an exhibitor for this event, not only will you have the ability to talk one-on-one to hundreds of potential customers during the strategically planned exhibit hall hours, but you will have the unique opportunity to show people what your equipment or services can actually do for them in the field (after all, seeing is believing!). Show people how your equipment or services work, and why it is/they are better than that of your competitors. Take advantage of the opportunity to conduct indoor or outdoor workshops and/or outdoor equipment demonstrations. YOU control how much exposure time you get and which forums you use to reach your market. No other Conference or Exposition gives you so many opportunities to actively participate in the event! Don't Be Disappointed … Secure Your Exhibit Space and Workshop Times TODAY! Don't settle for exhibiting at meetings that discuss topics of only peripheral interest to your business. Sign up as an exhibitor for this event NOW to be sure you don't miss this unmatched opportunity to reach such a large audience focused on equipment and services for environmental site characterization, sampling, monitoring and remediation! Indoor booths are located in the San Diego Hilton Resort and Spa on Mission Bay ballroom; Outdoor equipment spaces, suitable for drilling rigs, mobile labs, direct push rigs, remediation trailers, and other large equipment are in a level paved parking area immediately adjacent to the indoor meeting areas. Security will be provided for all outdoor exhibits during overnight hours. 39 Indoor booth spaces (27 9' x 9' booths; 12 10' x 10' booths) will be available in the main Exhibit Hall. 12 additional spaces will be available in an adjacent room. 15 Outdoor exhibit spaces (15' x 30') will be available. Additional specifications and exhibit information are available in the exhibitor's registration package. But don't delay -- exhibit space for the 2010 event SOLD OUT 3 months before the event -- register today to avoid disappointment. All companies registered for this event prior to August 23, 2010 have the opportunity to present at least two educational workshops (either Indoor or Outdoor) and two equipment demos as part of their exhibitor registration fee. Exhibitors have found that conducting workshops and equipment demos is a proven way to drive traffic to their exhibits. Companies registering after August 23 will be able to present workshops on an "as event scheduling permits" basis. Workshop titles and descriptions and Equipment Demo descriptions must be submitted to the event coordinator on the workshop/equipment demo form, which will be provided to each Exhibitor following receipt of the Exhibitor Application and Contract, for approval and scheduling. When deciding on the length of a workshop or equipment demo, do not underestimate the amount of time you need to do a thorough job and to accommodate attendee participation and questions. Workshops (Indoor or Outdoor) are technical presentations (2 hours Indoors; 1 hour Outdoors) intended to educate attendees on topical subject areas - they are not sales presentations. Workshops should be as unbiased as possible. All workshops must be practically oriented; workshops that include hands-on, interactive sessions are encouraged and will receive preferential placement. Workshops can be presented by company personnel, affiliated personnel, clients/customers or others familiar with your equipment. 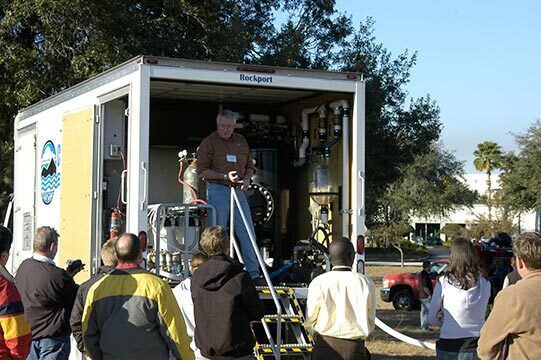 Equipment Demos (Outdoor) are technical presentations (30 minutes or 60 minutes) on specific pieces of equipment that should be focused on informing attendees about equipment capabilities, functions, applications and use in the field. Demos that include hands-on, interactive sessions with equipment are encouraged and will receive preferential placement. Equipment demos can be presented by company personnel, affiliated personnel, clients/customers or others who are familiar with your equipment. Interested in seeing how your company can contribute to the success of this event? Sign up today to join us in San Diego in January 2011! Packages will be sent out via e-mail within 48 hours of receiving your request.Contact Us if you have specific questions about exhibit space availability. Richard Brady & Associates, Inc.
Full Event Schedule for San Diego. Full Event Schedule for Tampa. More Than 60 Hours of Interactive Indoor Workshops at Each Location, Presented by Some of the World's Foremost Authorities in the Field, Discussing Cutting-Edge Field-Based Technologies and Methods for Environmental Site Characterization, Sampling, Monitoring, and Remediation. Topics Include Real-Time, High Resolution Site Charactrerization Methods and Case Histories; New Environmental Applications of Cone Penetration Testing and Direct-Push Technology; Advances in Hydraulic Conductivity Testing and Ground-Water Flow Measurement; Practical Guidelines for Vapor Intrusion Investigations; Innovative Soil and Ground-Water Sampling and Field Analytical Methods; Accelerated Site Remediation Using Surfactants, and Bioaugmentation (and Much, Much More!). More Than 24 Hours of Hands-On, Interactive Outdoor Workshops and Equipment Demos at Each Location Featuring the Latest Environmental Field Methods and Equipment. An Educational Exposition Featuring 40 Indoor and Outdoor Exhibits at Each Location Showcasing State-of-the-Science Environmental Field Equipment and Services. A Busy Social Calendar Throughout the Events, Which Will Make it Possible for You to Network With Colleagues and Make New Business Contacts During Your Stay in San Diego or Tampa. This one-of-a-kind event provides attendees with the unique opportunity to learn about the latest cutting-edge environmental field technologies that can be applied to solving today's and tomorrow's environmental problems. Don't just read information posted on a company web site or manufacturer's brochures - learn about the latest technologies from the people who have successfully used them on real projects and from the people who have designed and developed the latest in field equipment and instrumentation. Get your questions answered by the experts AND have the opportunity to see and try out the equipment under real-world field conditions. There is no other event out there that offers environmental professionals this kind of interactive opportunity! The 4 days of events during this conference and exposition will permit you to attend conference papers, indoor technical workshops, outdoor technical workshops and outdoor equipment demonstrations. In addition, an indoor exhibit hall and an outdoor exhibit area will be open throughout the event, which will allow you to discuss your equipment and service needs on a one-to-one basis with some of the country's leading environmental equipment manufacturers and service providers. The event features 58, 25-minute presentations given by a hand-selected group of leading experts in the field discussing recently available or unique technology and practices related to environmental site characterization, monitoring, sampling and remediation. An additional 9 conference platform papers on the response to the Gulf of Mexico oil spill are also featured on the conference program - the first time our industry will hear about the important work being done in the Gulf. LEARN WHAT IS REALLY NEW in the industry from the experts who are developing the leading edge technologies! A 2-hour keynote session and additional 2-hour morning and 4-hour afternoon session will kick off the conference on day one. Two morning and afternoon conference sessions of 4 hours each, held on the second day of the conference and the third day of the conference, and a final 4-hour session on the morning of day 4 will provide attendees with plenty of opportunities to learn about the latest site characterization, sampling, monitoring and remediation technologies and methods. Indoor workshops are practically oriented technical presentations designed to educate attendees on topical areas that tie into the theme of the conference and exposition. Indoor workshops are either one, two or four hours in duration and will be held on each of the 4 days of the event. To maximize instructor/attendee interaction, attendance at these indoor workshops is limited to 50 people each. What would a field conference and exposition be without hands-on practical field sessions? The outdoor workshops and equipment demonstrations provide attendees with the unique opportunity to actually see the latest equipment and technology in action under real field conditions. In many cases, conference attendees will be offered the opportunity to get some hands-on experience using the equipment being discussed. Where else can you do that?? Outdoor workshops are either one or two hours in duration and present an interactive technical discussion of a particular subject area or technology. Equipment demonstrations are 30 to 60-minute presentations on specific pieces of equipment. These demonstrations are designed to provide you with information about the equipment's capabilities, functions, applications and use in the field. Thank you for visiting The North American Environmental Field Conference & Exposition web site. Due to scheduling conflicts beyond our control, 2014 NAEFCon has been postponed. After scheduling issues have been sorted out, we will post updated information to this web site. Thank you to those who have contacted us regarding exhibit space and registration for the event. If you have any questions about the Conference, you can e-mail us at info@envirofieldschool.com. Our Fall 2013 schedule of field courses is now available on our sister web site: www.envirofieldschool.com.